In September 2013 IT Services launched a new VPN service, based around Junos Pulse. This replaced the older PPTP based service, but the two ran in parallel for 9 months to give people a chance to transition. 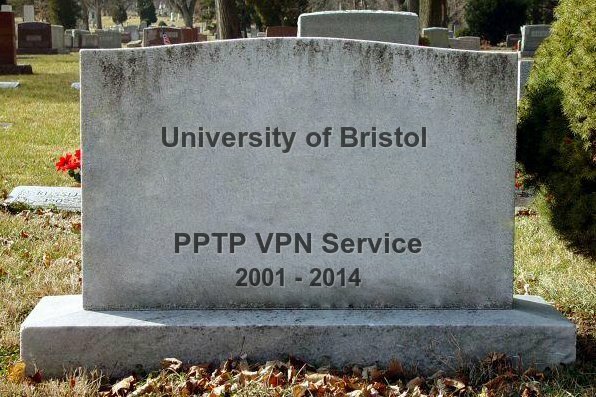 On 30th June 2014 08:45, the PPTP VPN was switched off, ending 12 years of PPTP VPN use at the University of Bristol. The idea was that you connected to the wireless (or plugged your laptop in to one of the public network sockets, and connected to the access network via PPPoE), then span up a VPN connection to get on the university network. By 2005 wireless technology had moved on and work started to replace the Nomadic Network with a wireless system which eventually evolved into the eduroam service we have today. Although the wireless no-longer had need of a VPN component, the VPN was retained and rebuilt as a stand alone service. The service had a refresh in 2007 to upgrade it to CentOS 5 – and it’s been running the same OS, on the same hardware ever since. So that’s why we’ve replaced it! In some ways, I’m sorry to see it go as it’s one of the services I was initially employed to support. In many other ways though, it’s done its job and been surpassed by other technology. Maintenance and support of the service had become problematic. It’s time to move on. For a service with approximately 500 users a month, it needed a surprising number of resources to keep it going. Now that it’s gone we can shut down 2 physical PPTP head nodes, 5 unmanaged virtual linux servers which provide supporting services (authentication, dhcp, dns, web redirects etc) and 2 hypervisors which are also out of hardware maintenance. The new Junos Pulse VPN is a single appliance. Much more efficient on rack space, power and cooling!